I had a bit of time to look around the Zurich airport recently. They are still going through some major renovation, but some areas have been finished. A refreshing change to nondescript fast food places is a new eatery that flirts with healthy - local- fresh theme. The green insignia of the Marche´corner invites with fresh breads, a salad bar, fresh juices, a grill station, pizza, fresh rösti as well as a pastry selection and a bar area. Since I had time until my flight was boarding I wanted to try something out. At 5 pm the bread counter looked a bit deserted with little choice left, but the bread that was available didn´t look bad. Plain or with nuts or olives, bread rolls, sweet muffins? I chose a loaf with olives as a little bring along present for my host. Storm Joachim was taking its share outside and many flights were cancelled. I remembered my travel motto: "Eat and sleep whenever you can, since you never know when is the next time". I can never say no to a good potato dish. 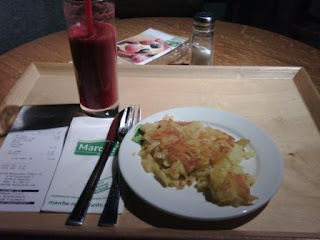 Rösti is a Swiss specialty. It is great just plain. More sofisticated versions with special cheeses from the Alps or Gorgonzola or with sausage or with vegetables or bacon or mushroom or egg can be found in restaurants offering Swiss specialties. The next 20 minutes passed tasting a gold brown thick rösti. The potatoes and the level of frying was good, the potatoes stuck together. I had to season with salt as none had been used in the cooking process. Another traveller was desperately looking for some salt too at another table - he had some grilled vegetables. It could be the health aspect, however unseasoned food hardly satisfies a belly. Grate the potatoes on the wide cut, thicker pieces give a stonger bite. A 24 cm diameter pan is easier in the cooking process than a very big pan. Heat the oil and butter on the pan. If you are using onion and bacon cook the chopped onion and the bacon strips in the oil until the onion is slightly glassy. Add the grated potatoes and mix with the onion and bacon. Season with salt, use less if you are cooking with bacon. Cook further and stir every now and then. Press the potatoes together to make a firm "cake" and place a plate on the potatoes. Cook on low heat for 15 minutes until a crust has formed and potatoes have browned. Turn once. Sprinkle the milk on the potatoes and cook another 10 minutes until the bottom turns golden brown. Serve as a standalone dish or as a side dish to a meat sauce. A popular Zürich specialty is rösti with a creamy veal and champignon sauce.